As Nashville’s real estate market boom continues with no end in sight, there are clear winners and losers. It’s not hard to find the winners among developers, investors, thriving professionals, contractors, architects, restaurateurs, health care and music companies, and promising startups. And certainly, there are plenty of additional dollars rolling into the city’s tax coffers and being used to improve or expand city services. But who’s paying the price for the success of others? Many neighborhood advocates say it’s the city’s low- and moderate-income residents who’re getting squeezed out of their rental units or homes to make way for upscale housing or commercial developments. Advocates are growing more concerned – and more willing to act on behalf of – residents who feel marginalized by Nashville’s dazzling growth. Indeed, some Nashvillians pushed out of their neighborhoods by rising property values and property taxes are often frustrated by their search for affordable housing elsewhere. Some say they end up searching for weeks, even months, for replacement housing that is as affordable as their former dwellings. Kennetha Patterson and her family have been forced to move from The Park at Hillside in Edgehill because of growth in the area by new developement. And new residences are often much farther away from core city neighborhoods, places of employment and vital services such as public transportation. Until a year ago Kennetha Patterson lived with her three children in a $675-a-month, two-bedroom apartment at The Park at Hillside, a 290-unit affordable housing complex in the Edgehill neighborhood. Edgehill is tucked in between two of the city’s trendiest neighborhoods – The Gulch and 12South. The area was predominately black for several generations with a mix of affordable-, middle- and working-class housing, apartments subsidized by Section 8 Housing credits and public housing. Section 8 vouchers pay the balance of a rent payment that exceeds 30 percent of a renter’s monthly income. The Park at Hillside is a 290-unit affordable housing complex in an area sandwiched between The Gulch and 12South. 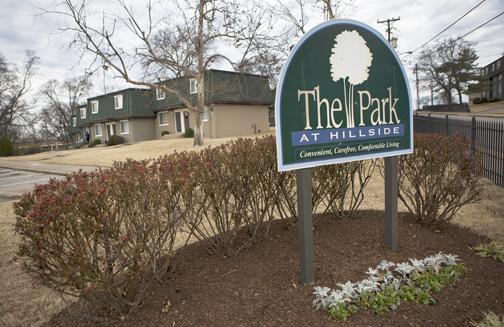 When The Park at Hillside sold to a New York company in 2013, Patterson says, rumors began to circulate that the new, out-of-state landlords wanted to push as many tenants as they could out of the complex to make way for a trendy, expensive development. Patterson and her family lived with relatives in Antioch and spent an entire year searching for an affordable alternative. “It’s been traumatizing,” she says. “Even a one-bedroom in the city is over $1,000. I can hardly believe how hard it’s been to find something suitable. 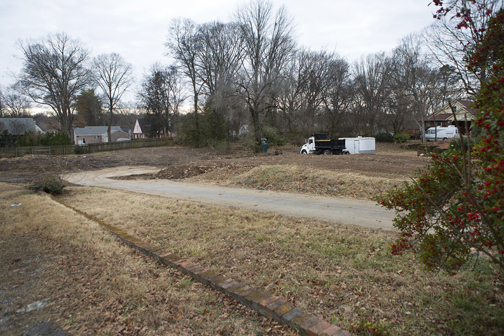 Three open lots sit vacant with plans for eight new homes to soon be built along Clayton Avenue in the 12South area. 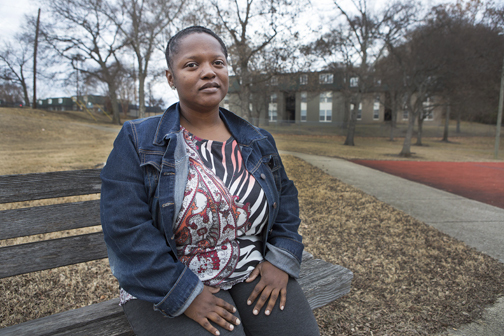 Since her housing situation became unstable, Patterson has gotten deeply involved with housing advocacy groups in Nashville and has met many other displaced residents in the process. “It’s not unusual for them (displaced residents) to feel desperate and afraid.” she says. “They end up moving to all kinds of different places, usually out of the city in places like Smyrna, Springfield or Gallatin. “Antioch used to be an option, but it’s gotten harder to find places there, too. “It’s just very hard to find an affordable place in the city itself,” Patterson adds. “You have to get further out to get decent rent. Even then, you pay a lot more than you used to pay. Patterson, who wanted to rent in the core of the city because she works at Centerstone Mental Health in South Nashville, recently found a rental big enough for her family in Cheatham County. It will cost her $1,200 a month, but a comparable unit in Nashville is more than $2,000 a month. Meanwhile, The Park at Hillside was never developed by the owner who evicted Patterson. It was recently sold to another developer, Nashville’s Elmington Capital, for $20.3 million. The company recently announced plans to redevelop the property into a community that includes affordable units alongside “market rate” (more expensive) units. Company representatives met with residents in December and told them they want to replace their current apartments with comparable units that rent for similar prices. That will mean demolition and building a much-denser, multi-floor housing complex. Construction would be tricky and involve a “staggered” construction schedule that would keep residents from being displaced while the new complex is being built. Even though Patterson is no longer a resident of The Park at Hillside, she attended The Park at Hillside’s community meeting with Elmington Capital because she’s passionate about the neighborhood, cares about her friends and wants to help preserve the character of the Edgehill neighborhood as it gentrifies. Affordable housing: Why should we care? Austin Sauerbrei, a community organizer with Edgehill Neighborhood Partnership, works full time helping Edgehill residents solve problems, especially those related to housing and traumatic displacement. Sauerbrei also hopes the deal with Elmington Capital ends up producing affordable units in the $650 to $900 range for current residents. He’s not 100 percent trusting of the plan because the current average rate for newly constructed two-bedroom apartments in the neighborhood start at $1,700 a month and goes up from there. “For so many longtime residents, this neighborhood is very much in a state of emergency,” Sauerbrei says. “If you are renting, you really don’t know if, at the end of your lease, your landlord will raise the rent or sell the property. It really is a huge stress for renters because they don’t know where to go. “No one is really opposed to development or growth, but we want to have more of a say in how things develop and we want to be able to stay in the neighborhood as it develops,” Sauerbrei adds. 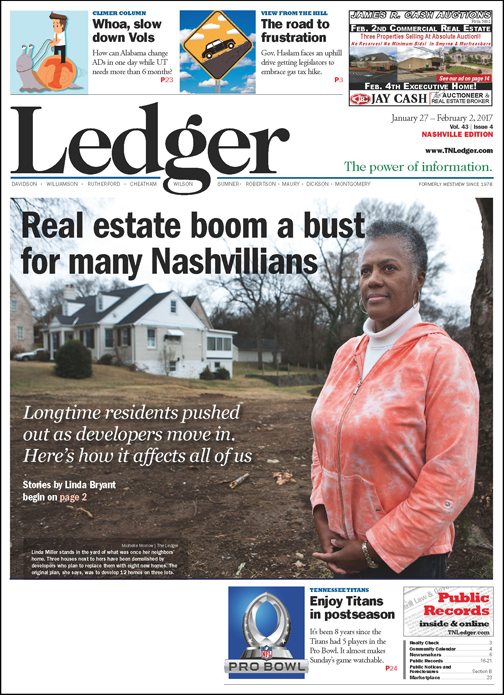 Paulette Coleman, another neighborhood activist in Nashville, says Edgehill’s story is familiar to residents of other gentrifying neighborhoods. “Many people are being left behind in spite of Nashville’s growth and dynamism,” Coleman explains. “A number of local and regional and national developers see us as a prosperous city with a low cost of living, no unions and lower wages. Coleman, an urban housing expert with a degree from MIT, also chairs the affordable housing task force for NOAH (Nashville Organized for Action and Hope). The 55-member interfaith group works on critical social justice issues in Nashville. “Right now people are taking advantage of the fact that Nashville is a good market,” she says. “If (a landlord) can make $1,200 a month versus $600, then of course it makes sense to do it. You can’t prevent a property owner from getting the highest and best use and return on their investment. Coleman and NOAH advocate for more aggressive policies and tools to solve the need for affordable housing. “There are many positive things in Nashville that have been done for affordable housing,” Coleman says. “But at the same time we need to ratchet it up. “We need the same kind of vision, focus and impetus we have for building the Music City Center for affordable housing.